How much dirt could a Dig Dug dug if a Dig Dug could dig dirt? 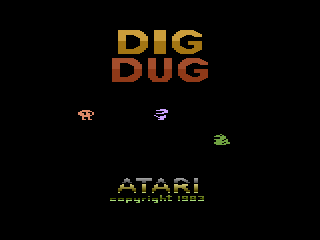 Dig Dug... While this game didn't win any awards for good English, it did become on of the most popular arcade games in history. Dig Dug combines fast action, strategy, and good clean non-violent fun into one amazing package. Dig Dug's easy to learn yet hard to master, gameplay made it a favorite at the arcades. According to the manual "You are Dig Dug, an intrepid gardener whose soil is infested with pesky Pookas and fire-breathing Fygars", dotcha just hate it when that happens? However your not just any intrepid gardener in a spacesuit, your Dig Dug, and you've come prepared. Dig Dug comes armed with his trusty air pump which he uses to blow up his enemies. Apparently all Pookas and Fygars come equipped with air nozzles for easy pumping (how convenient). Dig you must! Burrow your way through the soil hunting down all the Pookas and Fygars before they come looking for you! Although Pookas and Fygars can't normally move through solid dirt, they can turn into ghosts. Ghosts look like little white eyes and can freely move through the dirt; however once they reach open ground they'll revert back to their normal selves. Normally Pookas and Fygars don't turn into ghosts until later on it the round, so you have a little while to hunt them down in their tunnels. The pump isn't the only weapon at Dig Dug's disposal, for he is also master of the rock. 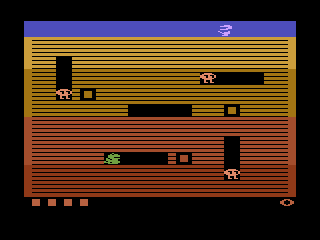 By burrowing under the rocks strategically placed around the screen, Dig Dug can drop them onto unwitting foes. Be careful that you're not under it when it falls though. After dropping two rocks a veggie will appear in the center of the screen (ala Pac-Man), you can grab this for bonus points if your into that sort of thing. While hunting down your opponents, take special care when approaching Fygars from the front. Since Fygars are little dragons they have the ability to breath fire! Make sure Dig Dug doesn't get burned to a crisp. 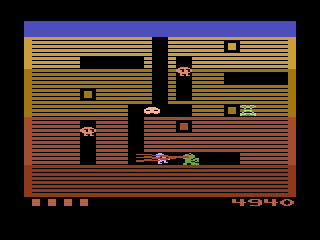 The graphics on the 2600 are pretty good given its limitations, however everything has a square look to it. This is probably due to the limitations of the graphic sprites, and couldn't be avoided. Thankfully Dig Dug plays very well, so arcade veterans won't be too disappointed. If the 2600 version has any faults, it's that the difficulty is a little too easy. Seasoned veterans are strongly encouraged to start out only at the highest levels. This minor quibble aside, the 2600 does a decent job of recreating the arcade classic.